CHARLOTTE AMALIE, St Thomas, USVI — Arriving in the US Virgin Islands from New York Thursday afternoon, August 25, 2016 after being extradited from Italy to face fraud and embezzlement charges, disgraced former senator Wayne James appeared before US Magistrate Judge Ruth Miller for his advise-of-rights hearing. But a determination to detain Mr James won’t come until Monday afternoon, August 29, 2016 as Mr James’ lawyer, St Croix attorney Michael Joseph, was unable to attend yesterday’s hearing. Mr James will remain in federal custody until then. Mr James, 55, was indicted on October 1, 2015, with two counts of wire fraud and one count of federal programme embezzlement. According to a federal indictment, from 2009 to 2011, Mr James served as chair of the Senate Committee on Youth, Education and Culture in the 28th Legislature. While serving as the chair, Mr James allegedly obtained tens of thousands of taxpayer dollars for the purpose of acquiring and translating historical documents related to the “Fireburn,” an 1878 uprising by freed slaves in St Croix. 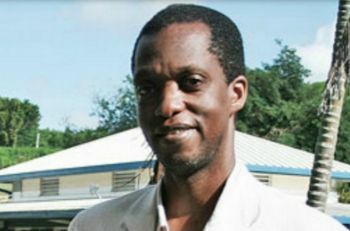 The indictment alleges that Mr James submitted false documents to the Legislature and received cash advances in order to conduct historical research on behalf of the people of the Virgin Islands. Mr James embezzled the cash advances for his own personal benefit instead of using them for the intended purposes, according to the indictment. An indictment is merely an allegation, and the defendant is presumed innocent until proven guilty beyond a reasonable doubt in a court of law, according to the US DOJ. Italian paper Gazzetta Di Modena showed Mr James being taken into custody by Italian police late June. Mr James, who once lived in the province of Pisa, sponsored an amateur football team in Italy, according to the paper. He was traced to an apartment in Nonantola, Italy, where he was a guest of some friends in the city of Modena, and was intent on writing a book titled “Manly Manners”, which contains a chapter dedicated to traditional balsamic vinegar of Modena. The FBI, Office of the Virgin Islands Inspector General and Internal Revenue Service-Criminal Investigation are investigating the case. Trial attorneys Amanda R. Vaughn and Justin D. Weitz of the Criminal Division’s Public Integrity Section and the US Attorney’s Office of the District of the Virgin Islands are prosecuting the case. Cristina M. Posa of the Justice Department’s Office of International Affairs provided significant assistance in this matter, according to the US DOJ. and we think this type of ting only happens in the usvi and other parts of the world, but no sorry here. this gov knows alot about this type of ting and lots more, since he worked with the world bank that aid in destroying so many african nation states and their governments. read up on how they are able to dictate and control the resources of most of africa. fork-tongues. live and learn. If you have proof bring it and if you dont then STFU! You can watch videos on any topic on YouTube. Watch and learn. I recommend "The Economic Jackal" this guy tells you as per his book as well, about the systematic pillaging of third world countries economical today. While you're on YouTube learn about your beloved crooked Hillary from the time Bill was governor of Arkansas. Also, checkout "Hillary's America" The filmmaker and author is a scholar, Dinesh D'Souza. Listen to his historical facts then wheel and come again. yeah its called misprints.imagine if we had to crack down on all government officials,what a fing joke. So will we see this type of criminal proceedings in this territory??? "yo could run but yo cant hide"
Simply state in details concerning " this type of thing" that is happening in the VI. You have s forum on this site locally and internationally using your pseudo name.Gov has said and common sense dictates that an investigation cannot start with vague accusation and no evidence. @Well. Pass the Whistle Blowers' Law and see how much proof come out. Where I work all I can do sometimes is shake my head for how certain things work. Can't say anything though, I need the few cents. to civil servant2 - and it will be like a mini wikiLeaks and panamaPapers? yeah u j**** @$$, what abut the sea cows bay harbor and the great wall in nanny cay, don't talk abut the green house project no take that amd smoke it up u know where!